One of the centerpieces at Sycamore Pumpkin Festival is the display of decorated pumpkins on the DeKalb County Courthouse lawn. There’s something about autumn that brings out the best in Midwestern communities. From the ripening harvest and rich colors emerging in the woods and fields to the tantalizing flavors of apples, pumpkins and spices, fall appeals to people of every age, with its fun, folklore and festivities. Here’s just a sampling of the attractions and destinations that bring us together as we savor all that our region has to offer. Illinois ranks No. 1 in the nation for producing pumpkins, with nearly 20,000 acres devoted to this popular squash. So, it’s hardly a surprise that one of the largest and most popular festivals in northern Illinois is inspired by the bright orange globes, which are coveted not only for the fun of carving but also for their flavorful contributions to both sweet and savory treats. The Sycamore Pumpkin Festival honors the pumpkin with a weekend of homespun family fun. This year’s event, scheduled for Wednesday, Oct. 26, through Sunday, Oct. 30, marks the festival’s 55th year. 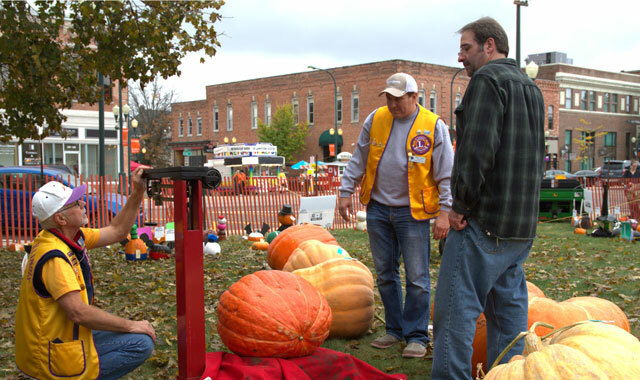 Sycamore’s Pumpkin Festival began with resident Wally Thurow, in 1956. His desire to provide something creative for Sycamore’s students has grown into a massive, volunteer-driven event that spotlights nonprofit organizations and appeals to autumn lovers across the area. Throughout the four-day festival, visitors can check out hundreds of decorated pumpkins on display at the courthouse lawn. There are two carnivals, one for kids and one for teens, and guests can shop at two craft shows, enjoy stories of ghosts and haunted sites – including a scary physics lab – play in a golf tournament, and find a variety of entertainment, from jugglers to magicians. Naturally, food plays a starring role in the Pumpkin Festival. Sycamore’s nonprofit groups will serve sit-down meals and festival favorites such as corndogs , brats, pork chop sandwiches, burgers, hot dogs, funnel cakes, elephant ears, sweet corn and tacos. Hearty eaters can sign up for Saturday’s pie-eating contest and then run all those calories off in the Sycamore Chamber of Commerce 10K road run, which happens Sunday morning. Add costume contests and a free pumpkin giveaway to the mix, followed by a big 90-minute parade starting at 1 p.m. on Sunday. Learn more by visiting sycamorepumpkinfestival.com. Scarecrows hold a firm place in American history, tradition and literature. From the kindly, simple scarecrow in “The Wizard of Oz” to darker roles in horror cinema, this symbol of homeland America has inspired everything from autumn decorations to Halloween costumes and lively competitions. The 31st Annual Scarecrow Fest in downtown St. Charles is no exception. Produced by the Greater St. Charles Convention and Visitors Bureau (GSCCVB), the nationally recognized festival runs this year from Oct.7 through 9. Lincoln Park and the James Martin parking lots at Cedar and Third streets will host the contest that is the festival’s centerpiece. Dozens of handcrafted scarecrows built by local residents will be on display at this year’s contest. Competition is fierce, as each scarecrow builder seeks to win over attendees, who determine the winner by popular vote. The Mega Scarecrow category returns this year, allowing 12 entrants to make a statement with an oversized display. Area clubs, schools, individuals and businesses are encouraged to enter for the cash prizes awarded to the three winners. Additionally, the clubs/nonprofit/individual category will include seven prizes. The contest features three more challenging categories: the mechanical, family and Greater St. Charles Business categories. Scarecrow Fest is one way to discover the downtown area. “We have a lot going on during the Fest, including the new Baltria Vintage Auto Gallery display and returning events such as the Autumn on the Fox Arts and Crafts Show, Windy City Amusements carnival, a petting zoo, lots of great food both at the festival and in our restaurants, live entertainment and many great activities for the whole family,” she says. Along with interactive games and activities including golf, families can build their own scarecrow as a lasting memento. In all the fun and excitement of the fall season, one event stands out as truly unique. Nightmare on Chicago Street focuses not on lighthearted themes but a much darker subject: zombies. From those deliciously scary black-and-white movies like “Night of the Living Dead” to Michael Jackson’s “Thriller,” zombies have captured the imagination and tickled the backbones of horror movie fans. And with the popularity of the “Walking Dead” television series, the genre has truly come of age. As nightfall creeps into Elgin on Saturday, Oct. 22, the safest place to shelter is downtown, around Chicago Street. But when it comes to invasions, infestations and zombies, no place is ever truly safe. The adults-only festival takes place within a “Safe Zone” that will be under heavy “military” control this year, in order to keep everyone safe from the zombie infection. “Survivors” can enter the festival at checkpoints on Spring Street, Douglas Avenue and Grove Avenue. Around these several blocks in downtown Elgin, expect to see what looks like a zombie apocalypse movie set. Businesses will be boarded up, trash will be strewn around, a few burning tires and abandoned cars will be present, and a few zombies will be caged up. Within the “Safe Zone,” visitors will be surrounded by actors portraying military personnel, concerned citizens and a group calling itself the Zombie Defense Initiative. Some businesses in this area will be open, and survivors can find food, shelter, medical treatment and many more food and drink stations. Surprises abound at this event, so it’s possible that visitors may spy protesters fighting for zombie rights and the occasional zombie march. Against this backdrop, the living can enjoy four stages of entertainment (not all of it musical), multiple vendors, live graffiti artists and special guests like Svengoolie, host of the self-titled TV program that airs classic B-level horror films. Costumes are encouraged, and judges at a YWCA costume contest will select the best entries in horror/zombie costume, fantasy/sci-fi/superhero, best couples/group and overall costume. Tickets for this year’s event can be purchased online at nightmareonchicagostreet.com, or at the entrance gates. Note that because this event is aimed at adults, children under the age of 17 will not be admitted without a guardian. No weapons, fake or real, are allowed inside the festival. Fall Attractions in Galena, Ill.
Galena draws visitors year-round because of its dramatic scenery, charming shops, hospitable bed-and-breakfasts and its fascinating history. But when fall rolls around, the region’s appeal is multiplied with several classic Midwestern festivals. A trip to Galena always begins with a tour through the winding hilltops of northwest Illinois’ Driftless Area. Meandering through these hills and valleys during the fall, drivers can enjoy expansive and color-full views of the scenery and quaint small towns. On Oct. 1, thousands of visitors and more than 100 wiener dogs are expected to gather at Depot Park for the annual Lion’s Club Octoberfest. This free event running from noon to 10 p.m. serves up nonstop live music, polka lessons and dancing, a bean bag tournament, a beer stein endurance contest and the signature wiener dog races. A family-friendly event, Octoberfest includes the children in a pumpkin decorating activity and bounce house. The annual Galena Country Fair the following weekend, on Oct. 8 and 9, features more than 150 artisans selling original, handmade arts and crafts as well as fine art. Held in Grant Park overlooking Galena’s historic downtown district, the fair has become a weekend tradition for thousands of discriminating art enthusiasts. Food is high on the list of attractions as well, with such popular autumn taste treats as caramel apples, homemade french fries, funnel cakes, fudge, hearty baked potatoes and ice cream. Live entertainment includes bands and Irish dancing. At the same time, visitors can take home the flavors and savors of the season from a bustling farmers’ market and a county bake sale stocked with goodies from Jo Daviess County’s finest bakers. For children, the weekend offers loads of games while the entire family can enter into a silent auction, raffle and more. Many art lovers will return the next weekend, Oct. 14 through 16, for the annual Twenty-One Dirty Hands Tour. Pottery lovers can see some of the best-known pottery and sculpture studios in the Midwest, as artists open up their spaces, showcase their work and give tours of their working kilns, forges and studios. October wraps up with the city’s popular Halloween parade on Saturday, Oct. 29, at 6:30 p.m.
A popular location for day trips or weekend destinations year-round, Galena beckons visitors to indulge in all things autumn during October and November. This entry was posted on Monday, October 10th, 2016 at 11:57 am	and is filed under Features, Top Posts. You can follow any responses to this entry through the RSS 2.0 feed. Both comments and pings are currently closed.